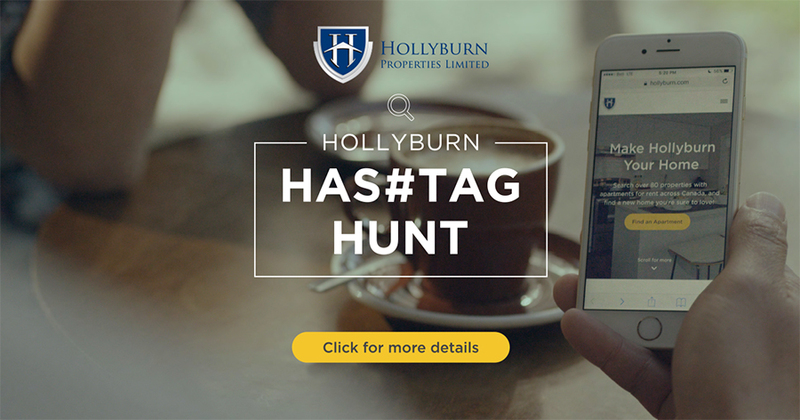 We’re launching our new website with the Hollyburn Hashtag Hunt—a month-long digital scavenger hunt contest with a chance to win one of four $1,500 prize packages! Each Monday, check for a clue posted on any of our social media platforms. Use that clue to find a specific page on our website. Read through the page’s content and find the #HollyburnHashtagHunt hyperlink. Click the link and complete the form to enter the draw! Each week’s Winner will be selected at random, and announced via e-mail and on social media on Monday of the following week. Contestants must be following Hollyburn Properties on at least one of the three social media channels listed to be eligible for the prize. Each Monday during the contest period, we will be sharing a clue on our social media – accounts Facebook, Twitter and Instagram. Follow this clue to explore a different page on our new website and find the #HollyburnHashtagHunt hyperlink. This link will direct you to a contest entry form to complete. We will draw the winning weekly contest entry at random from all contest entries received during the week.. The clues will be announced on Mondays at 9am PST. Entries for that week will be accepted until 11:59pm on Friday of that week. Each week’s Winner will be announced the following Monday via e-mail and social media, along with the next week’s clue. Participants are welcome to submit an entry for each week. 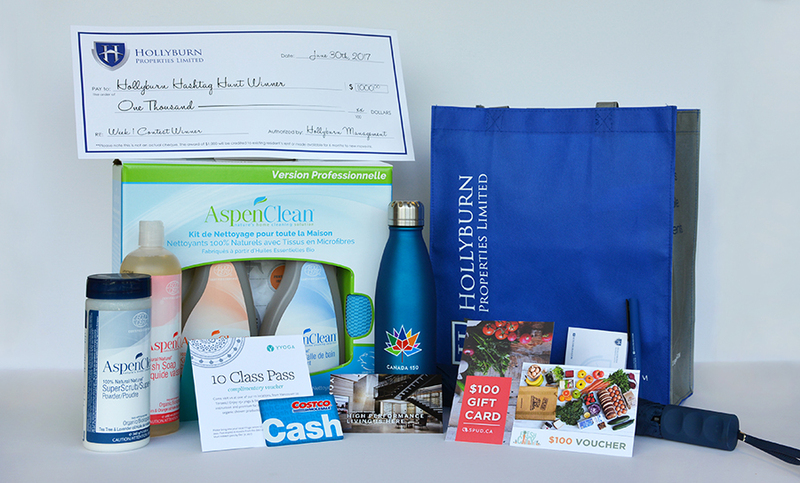 Weekly prize consists of a one-time $1,000 discount off one month’s rent in one of Hollyburn Properties’ residential buildings as well as a prize package worth approximately $500 with gift cards from our Value-Added Partner Program. Contest Period: The Hollyburn Hashtag Hunt begins on Monday, June 26th, 2017 00:01 PST and ends on Monday, July 21th, 2017, 11:59 pm PST. Gift Cards: The value of each Gift Card may be adjusted for a total value of $500 combined. Winner Selection: One winner will be selected each week for a total of four winners during the time of the Hollyburn Hashtag Hunt. All entries submitted for that week will be compiled into a database and selected at random. Winners will be announced the Monday following the entry deadline for each week. Potential Winners will be contacted by e-mail and/or phone, and have five business days to respond and claim their prize, or the prize will be forfeited. All Winners will be required to enter a skill testing question and sign a declaration and release before being awarded a prize. Read the full contest rules and guidelines.